There are many floor sanding contractors, far and wide. An online search will unearth all manner of offers from websites and contractors who promise to give your home that magical makeover. Even though the overall result may be the same, the methods employed sometimes differ by contractors. Subsequently, this has led to a series of assumptions, questions and even myths. Therefore, this post aims to answer some of the questions you might have concerning floor sanding and how to go about choosing the right contractor. Will recoating every three years keep my floor in shape? One of the common assumptions (which in part was actually encouraged by certain floor sanding contractors) is that recoating your floor every two or three years will ensure it lasts longer. While there is no problem carrying out regular maintenance of your floor if you have the budget to do so, the truth is that modern floor finishes are h3 and long lasting. This means that there’s really no need for recoating or maintenance by any contractor after the initial sanding to make your floor last longer. This is assuming the initial contractor did a good job on your floor in the first place. Depending on your own personal maintenance ethos (i.e. how well you take care of your floor), you won’t need to sand your floor every three years. In fact, the earliest you’ll need to recoat your floor is 10 years. In most cases, floors stay in good shape without recoating for as long as 30 years. However, this depends on how well you take care of it. Does the type of floor finish determine how long it will last? To a large extent, the type of floor finish used will determine the durability of your floor coating. Of course, all finishing – regardless of quality – will last a long time, subject to your personal maintenance habits; as with everything else though, the better the quality, the longer it lasts. Let us imagine that a regular floor finish keeps your floor in good shape for 20 years. In this case, it’s safe to assume that a better quality finish maintain it for at least a decade more, making it 30 years in total. It is however important to pay attention during the sanding and coating of your floor. Make sure the contractors don’t skip the important parts, such as applying the appropriate number of coats and allowing enough time to dry between coats. Also, consider buffs during coating, so that your floor will stay in good shape and won’t need refinishing for a long time to come – probably for as long as you live in the house. Does sanding a hardwood floor pose any danger? If you make the mistake of using an inexperienced contractor, sanding can put your home at risk. Because of the process involved, there is the risk of fire outbreak if you have the wrong person sanding the floor of your home. This is why it’s important to work with a contractor who has a lot of sanding operations under their belt. Don’t forget that mistakes do happen, regardless of the level of experience and skill. This is why it’s imperative that as much as possible, you keep an eye out on the sanding process to ensure certain fail-safes are put in place. For instance, you’ll need to make sure that whoever is undertaking the floor sanding properly connects the sanding belt to the main electric fuse. Don’t allow loose wires on your property, as this can increase the risk of both electric shock and fire. Additionally, ensure that bags containing floor dust are taken out of the house and disposed of properly at the end of the day. If not appropriately disposed of, floor dust and shavings can heat up and burst into flames. When planning to sand your floor, remember that your safety is important, so choose a contractor you can trust, regardless of your budget. What exactly is dustless flooring? The advancement in flooring techniques means there is very little dust present whilst your floor is being worked on. However, note that you’ll still have to deal with dust when cleaning the floor. Most people assume that the term dustless flooring implies they are not supposed to see any dust at the end of the project. Subsequently, when they find dust, they presume that the job wasn’t well done. On the contrary, there is no flooring process where you will not see dust. Suffice to say, if it was to be completely dust-free, the process would be called dust-free flooring and not dustless flooring. Is there more to sanding a floor than just sanding? 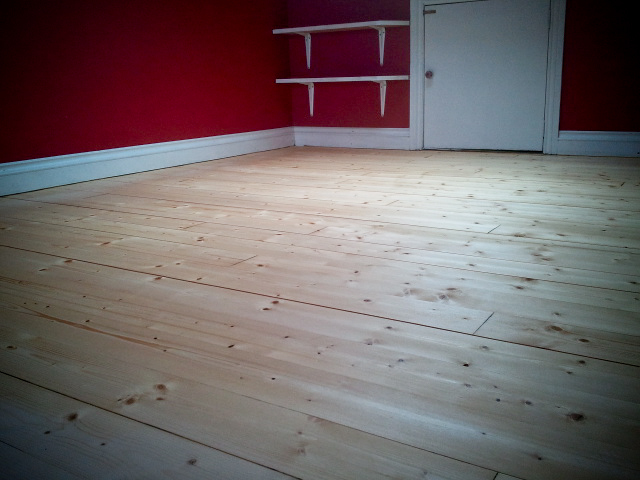 Floor sanding involves a lot more than just sanding a floor and applying two coats of paint. It is a complex home improvement project that entails a lot of planning, preparation and financial investment. At the end of the sanding process, you’ll want to see a beautiful floor, which sanding alone won’t give you. A good contractor knows that apart from the planning and preparation, sanding also involves nail setting, hole and dents repairs and filling, as well as the replacement of weak or damaged boards. Once all these steps are covered, you can be sure of having a beautiful floor for decades to come. Will exposed nails affect floor sanding? As a result of age, improper floor installation or a weak under layer, nails can push up from the wood to visibly appear on your floor. This doesn’t mean your floor can no longer be sanded, though some contractors may try to convince you to install a new one. If you feel you need a new floor and have the money to have one installed, then you might choose to do so. However, a good contractor will know the best way to sand your floor, giving you the best results, without having to remove a floor that probably has 10 years of life still left in it. Refinishing Or Replacing A Hardwood Floor: Which Is Best For You?